For people who love clothing and textiles, few things are more disheartening than to discover that a favorite garment needs some mending. And if you aren’t sure how to make the necessary repairs, those pieces serve as a silent reproach as they pile up in the closet corners. 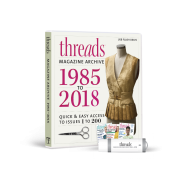 Mending is often associated with a bygone era, an old-fashioned activity for people who had limited access to manufactured goods, lived through the Great Depression, or made do with wartime rations. 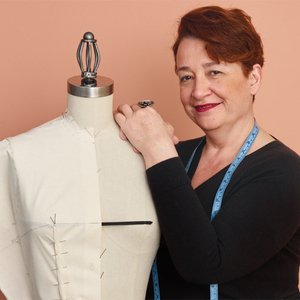 With the accessibility of inexpensive fashion, mending fell out of practice. The current shift in economic realities and concerns over global sustainability may have caused you to reflect on a time when consumers made, purchased, and wore high-quality cloth-and knew how to care for them. 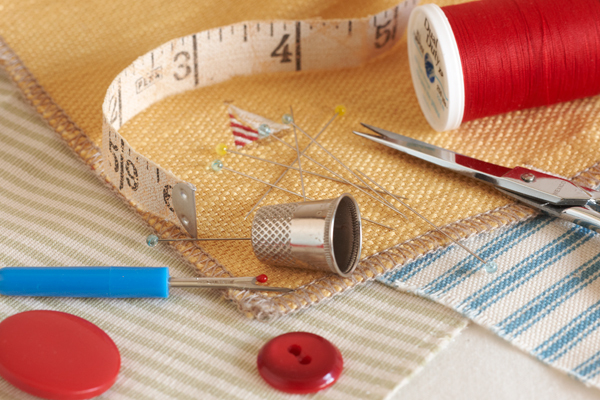 Mending is remarkably easy, surprisingly quick, and extraordinarily gratifying. Learning how to evaluate a damaged area and becoming familiar with the basic techniques are all that’s needed to get started. 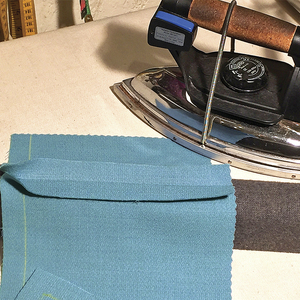 By mending treasured garments, you can enjoy them longer, take pleasure in your artisanal self-sufficiency, and do your part in leaving a smaller footprint on the planet. Now that’s cutting edge! 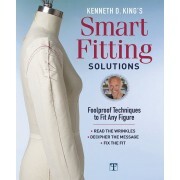 When evaluating garment damage, first determine whether mending is possible and if it will save the garment. 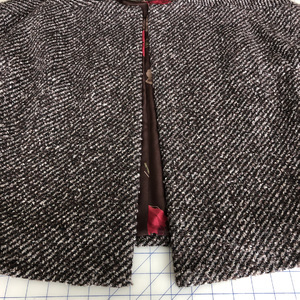 A mend may be possible if the damage is to elements of a garment’s construction, such as released seams or darts, loose buttons, worn buttonholes, loose beads or sequins, tired elastic, a broken zipper, a fallen hem or cuff. Mending also is possible if the damage is to hidden elements, such as shabby lining, a hole in an inside pocket, under a button, or in a sock. A mend may not be possible if the damage involves the textile itself, such as rips and tears or insect damage in the body of the cloth, deterioration, shattering, or loss. Shattered silk is nearly, if not completely, impossible to mend. What is the garment’s value? Does the garment fit and/or will it fit after it’s mended? Will the garment be worn after it is mended? Will it be outgrown soon, or can it be handed down? 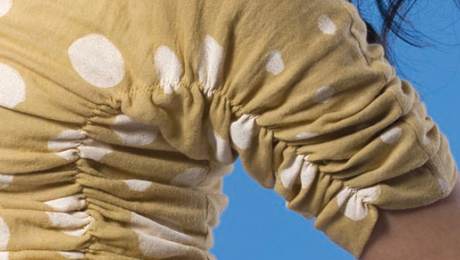 What is the garment’s overall condition? Does it have more wear in it? Will the mend cause further damage? Can it be mended inconspicuously? Is the garment a collectible or an heirloom that should be retired and carefully stored away? 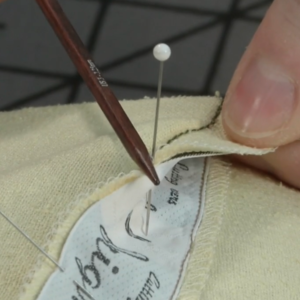 Follow these general guidelines to help you to properly repair and care for your garments. Always carefully launder or dry clean a garment before mending-handling a soiled garment can permanently work the soil into the fibers. Also, most mends involve the use of an iron, and a hot iron will set a stain. 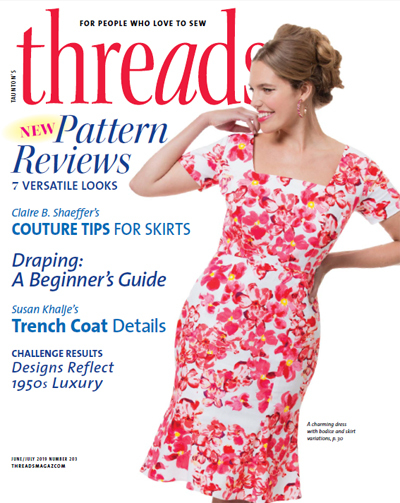 Use a thread or yarn that matches the textile’s character and color. This ensures an invisible and balanced mend. 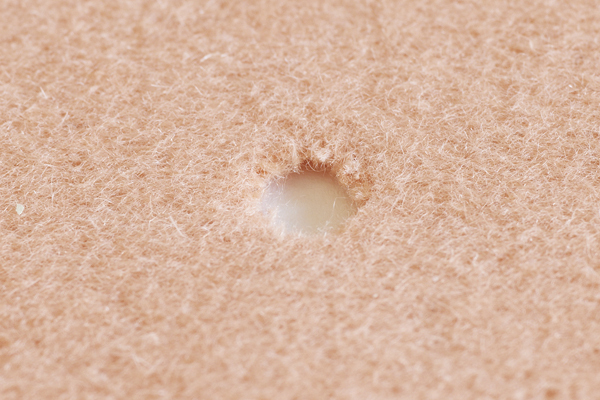 Choose a patching fabric that is equal to or lighter in weight than the garment being repaired. 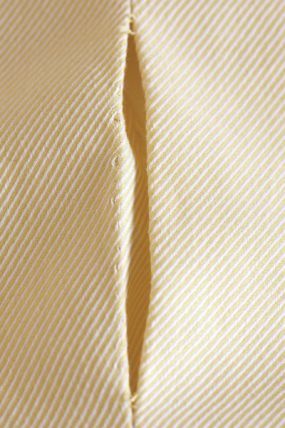 The repair fabric should not fight or overwhelm the original fabric or it can cause more damage later. 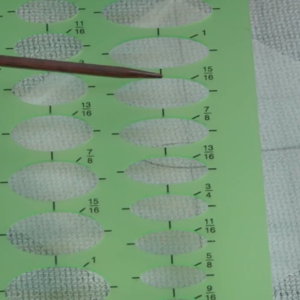 Ensure accuracy by basting the reinforcing fabric to the garment before beginning with the repair. 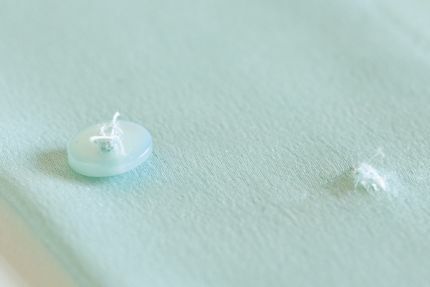 Always test adhesive mending products on a small, inconspicuous area of the garment before using. They can react with textiles, causing permanent damage, including discoloration and accelerated decay. 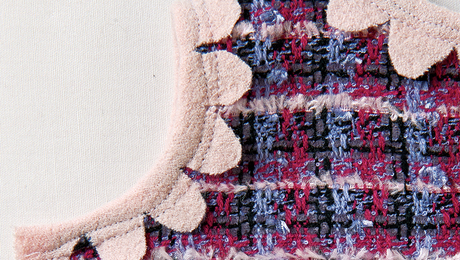 Hand stitches are sometimes preferable to machine sewing. They can be easier to control and to remove in the event that a repair needs to be redone. 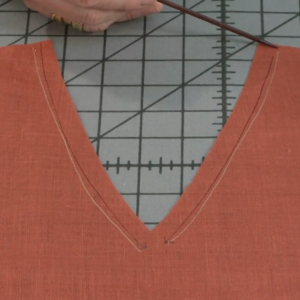 Also, some hard-to-reach areas of a garment are easier to get at by hand than with a machine. Here are a few common damages that are easily repaired. 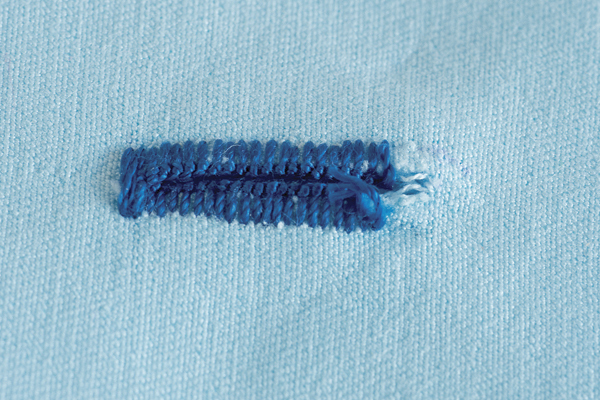 Be sure to use mending materials that are equal or similar to the garment’s fiber content and weight. 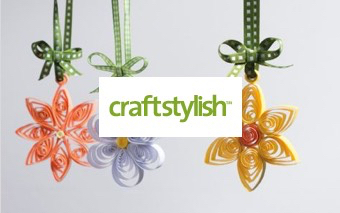 Select a wool yarn that matches the fabric’s color, then unravel and pull it apart to create loose fibers. Place a piece of ethafoam (ConservationResources.com) under the hole. 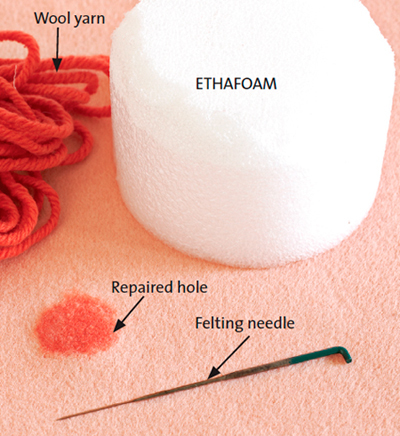 Use a felting needle from the fabric’s right side to work the fibers into the material. Trim and continue to work the fibers until they match the surface. Repair small holes in wool fabric with felting. Felt wool yarn into the hole until it is smooth with the fabric’s surface. A contrasting color yarn was used for visibility. 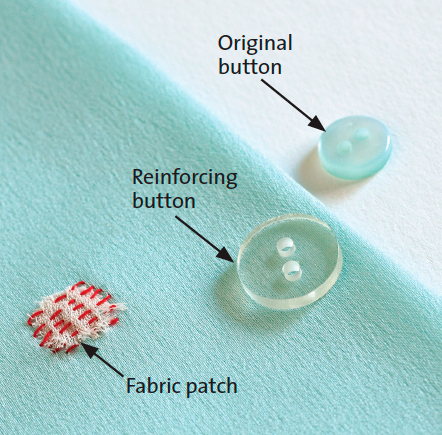 Make a fabric patch slightly smaller than the button. 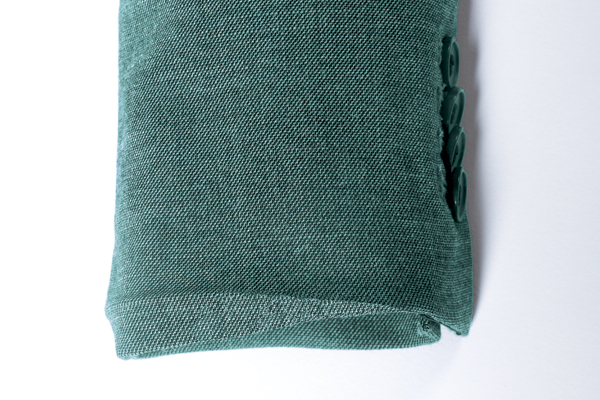 Use a similar fabric, equal to or lighter in weight than the garment. 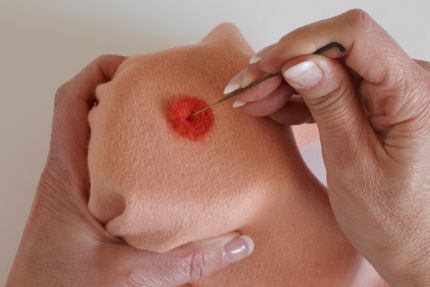 Baste the patch to the garment’s wrong side or between a facing and the outer fabric. Work machine darning or hand running stitches across and slightly beyond the patch, stitching through the patch and the garment. Reattach the button with a reinforcing button underneath that is slightly larger than the patch. Fix tears and tiny holes from pulled-through buttons with a small patch. A contrasting color patch was used for visibility. Working on the garment’s wrong side, press the seam closed. 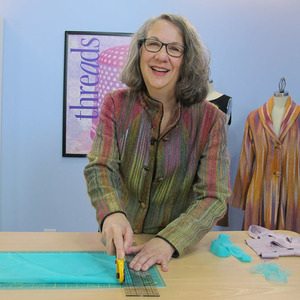 Trim any loose threads. 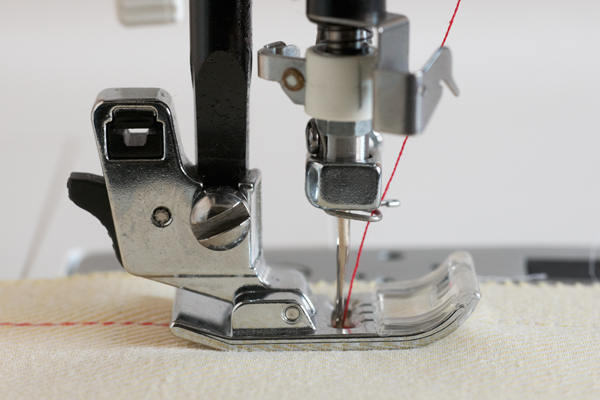 Replace the seamline’s missing stitches with a machine stitch, or hand backstitches, that equals the original seam’s stitch length. 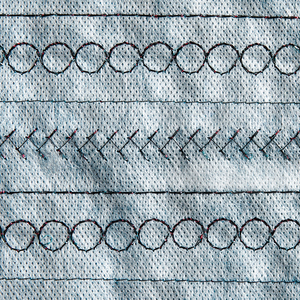 Overlap existing stitches, taking care to sew through the original holes. Press the seam back to its original finished position. 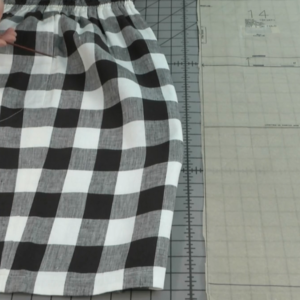 To close split seams, follow the exact stitching line by sewing in the original holes. 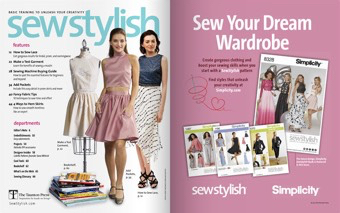 If a jacket or coat sleeve hem is not attached to the fashion fabric, it will eventually droop. To fix this, release the lining, and press out creases on the fashion fabric. 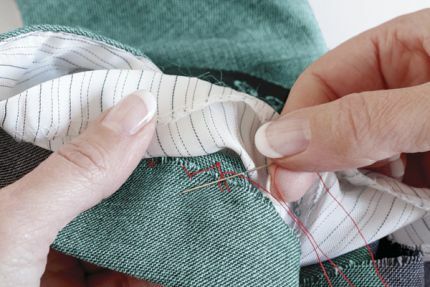 Return the garment cuff or hem to its original correct position, and gently press and stitch the hem allowance in the right place using a catchstitch. Then press the lining to remove creases, and return it to its correct position. Use blindstitches to reattach it, making sure there is a soft fold at the bottom for ease. Press gently. 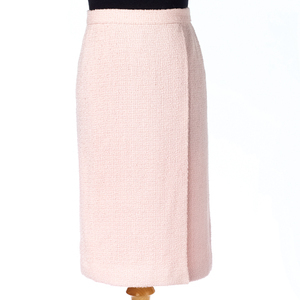 Drooping bag-lined sleeve hems can be re-pressed and sewn. Press and then sew the garment with hand catchstitching. 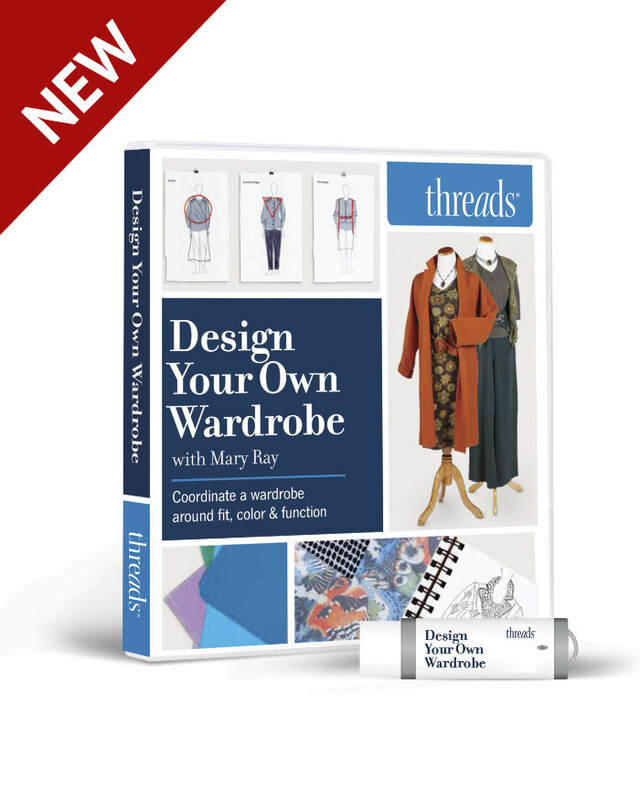 Trim any loose threads or frayed fabric. 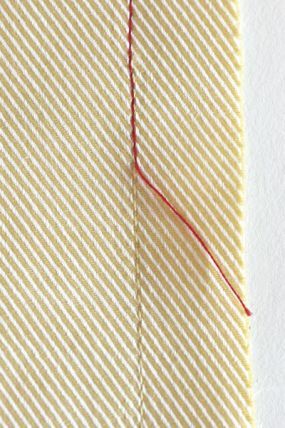 Baste a small matching fabric patch that is equal to or lighter in weight than the garment under the worn buttonhole. Using thread that matches the fabric, work neat rows of small running stitches through all layers across the patched area. Restitch the buttonhole through the patch, overlapping the previous stitching. If sewing by hand, cut open the buttonhole before stitching, if sewing by machine, recut the buttonhole after it is sewn. Worn buttonholes can be restitched. Baste a fabirc patch behind the garment, and then restitch the buttonhole. Materials provided by International Silks and Woolens, Los Angeles, California, InternationalSilks.com. Your pictures are so much more clear online than they are in the magazine. Is the garment a collectible or an heirloom that should be retired and carefully stored away? Conservation techniques and approaches deviate to another path after the question of the collectible or heirloom value is determined. 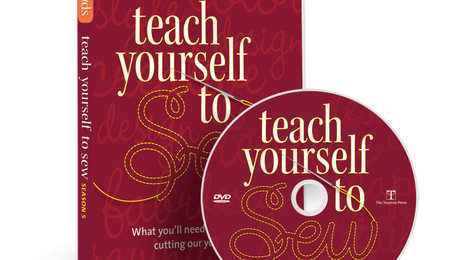 The rest of the questions and the techniques you have introduced are terrific for a garment that's destiny is to be worn to death. So many lovely possibilities there, repair, recycle, reimagine. I have done mending on garment leather. It is so important to match exactly the stitch size to get the needle to land in the original holes! Thanks, I love the tip on how to mend holes in wool. Great article! I am probably the only person in the world who likes to mend or make something new again....... I consider it a challenge to fix something or present it in a new way or fool the eye. Good reminder of mending techniques. My grandmother taught me how to darn socks and linens when I was a kid. 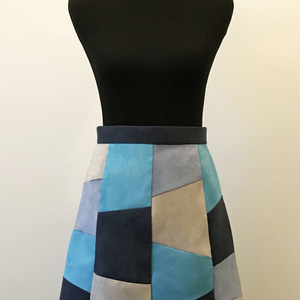 I've used all of these techniques except the felting. 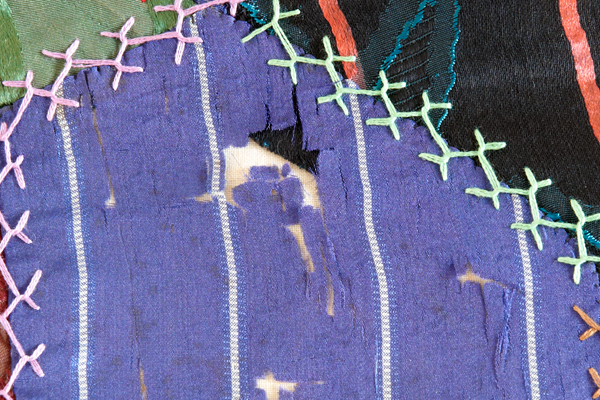 It's a better solution that the one my sister used back in the 1970's to "repair" a badly moth-eaten sweater - she embroidered a flower around each hole. It was cute but no longer warm! 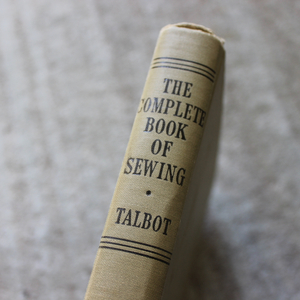 An article showing how to mend and alter knitwear would be useful, too. I liked the techniques. 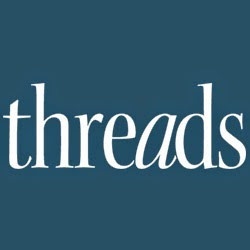 I would like to see repairs that used the correct thread colors alongside the demonstration repairs. 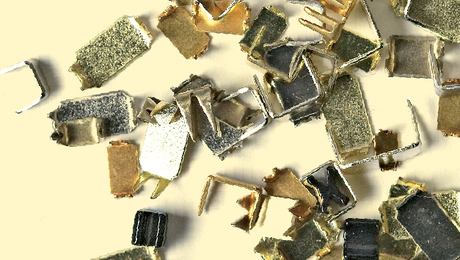 Mending and repairing is so important, especially if you have an article you really like. Using small stitches with matching thread is what I do. I need new ideas an techniques of repairing an article that has lots of wear left in it.